A pair of Chinese semi precious stone crafted into a small magnolia tree. The tree is planted in a Chinese cloisonne pot. The container's body has a lovely blue background with abstracted lotus design, old gilt on edges. 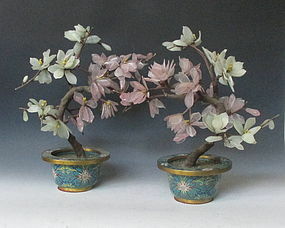 The entire tree is crafted as if an actual plant is planted in the pots.The cloisonne appears to be late 19th century. The semiprecious stones are of a later vintage. Age: Republic Period Size: Length 17.5" Width 7" Height 14"